Did JetBlue AIrlines celebrate its 20th birthday by providing two free tickets to everyone? 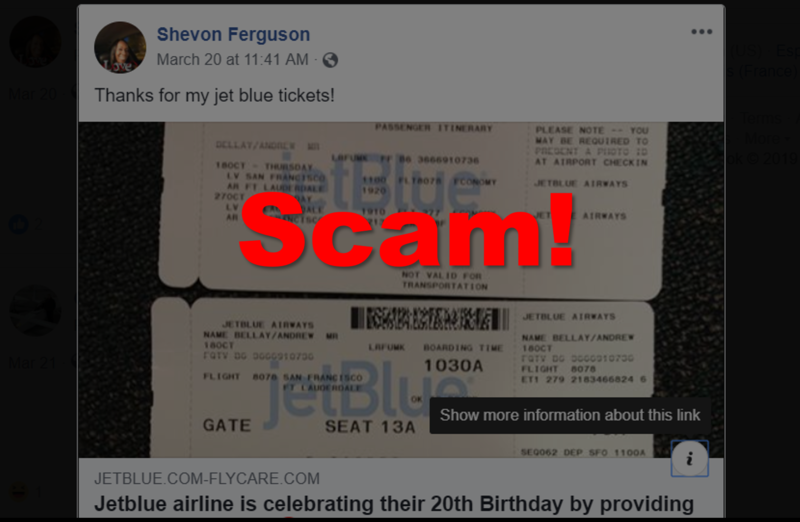 No, that's not true: It is a click bait scam that could result in your computer and person data being compromised, and it certainly will not result in you getting a free trip on JetBlue. The airline has warned about this scam for years, yet it persists. JetBlue has been trying to ground this scam for years. This is a post from seven years ago in which the airline warns about it. Please know that we don't like to see our customers taken advantage of, and any contest or sweepstakes JetBlue runs would be hosted on an official JetBlue channel: jetblue.com or our social profiles at facebook.com/jetblue or twitter.com/jetblue. Contests from JetBlue would not come from an untrusted (and kinda ugly) third party site. Please help us combat these scammers, by helping others identify this scam. Other airlines have been the target of similar scams, including Delta and Alaska Airlines.